Dr. Mark Geier has a medical degree and PhD in genetics from George Washington University. He is a Fellow of the American College of Epidemiology. Dr. Geier was a research scientist at the National Institute of Mental Health at the National Institutes of Health (NIH) for 10 years. During Dr. Geier’s tenure at the NIH, he was one of the original pioneers of the field of genetic engineering. Dr. Geier’s acclaimed pioneering research on genetic engineering was covered in Time Magazine, Newsweek, the New York Times, and other national and international publications. He was an assistant professor in the Department of Gynecology and Obstetrics at Johns Hopkins School of Medicine and an assistant research professor in the Department of Psychiatry at the Uniformed School of the Health Sciences. Dr. Geier was in the private practice of medicine for more than 33 years with medical offices across the United States. During which time, he provided medical care and procedures to more than 30,000 women with high risk pregnancies and more 1,000 patients diagnosed with neurodevelopmental disorders such as autism, attention deficit disorder, and learning disabilities. 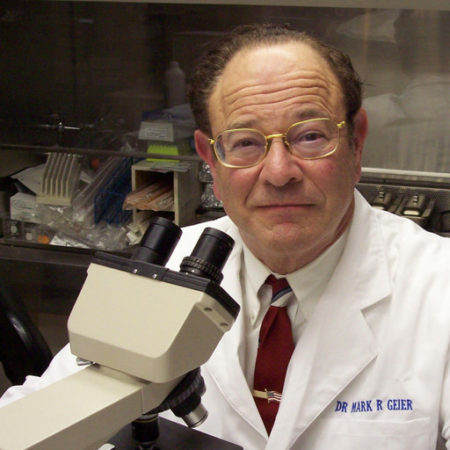 Dr. Mark Geier was also the laboratory director of a CLIA-approved laboratory that provided genetic-molecular analyses on tens of thousands of clinical specimens for more than 20 years. Dr. Geier has published almost 200 peer-reviewed scientific/medical studies in academic journals and medical book chapters. Dr. Mark Geier’s research has repeatedly been published in such prestigious academic journals as Nature, Science, the New England Journal of Medicine, Lancet, and Experimental Biology and Medicine. The focus of Dr. Mark Geier’s research has included cellular molecular-biology studies, large population observational epidemiological studies, and human placebo-controlled randomized clinical trials. As a result of the importance of Dr. Mark Geier’s research, he was invited to address the US State Department, Foreign Institute regarding contemporary genetics, the Institute of Medicine of the United States National Academy of Sciences on multiple occasions regarding vaccine safety and policy, and the Government Reform Committee of the United States House of Representatives on Thimerosal. Dr. Geier was also an accredited participant in the Intergovernmental Negotiating Committee meetings of the United Nations Environmental Programme on helping to prepare a global legally binding instrument on mercury, the “Minimata Convention on Mercury“. Dr. Mark Geier is one of original co-founders and co-directors of the non-profit 501(c)3 Institute of Chronic Illnesses, Inc. foundation (founded in 2006), which has raised more than more than a million dollars in grants and donations since its inception by various esteemed individuals and non-profit foundations such as the Autism Research Institute, the Strategic Autism Initiative, the Brenen Hornstein Autism Research and Education Foundation, and the International Academy of Oral Medicine and Toxicology, and helped to support the publication of more than 40 scientific/medical research studies in peer-reviewed academic and medical journals. Dr. Geier is also one of original co-founders and co-directors of the non-profit 501(c)3 CoMeD, Inc, foundation (founded in 2007), which has received several hundred thousands of dollars of donations and grants since its inception by various esteemed individuals and non-profit foundations to support its extensive educational efforts.